My name is Optimus, Optimus Prime! – Making Memories in The Chaos. One of the boys favourite activities at this time of year is sitting looking through the Argos catalogue, page by page, picking out what they want for Christmas! If I’m honest, I LOVE doing it too – it is one of those things that just screams Christmas – a bit like the Coca – Cola advert on T.V! So, when Argos got in touch and asked us to work in collaboration with them as they draw up their Dream Toys List 2013 – my heart skipped a beat!! 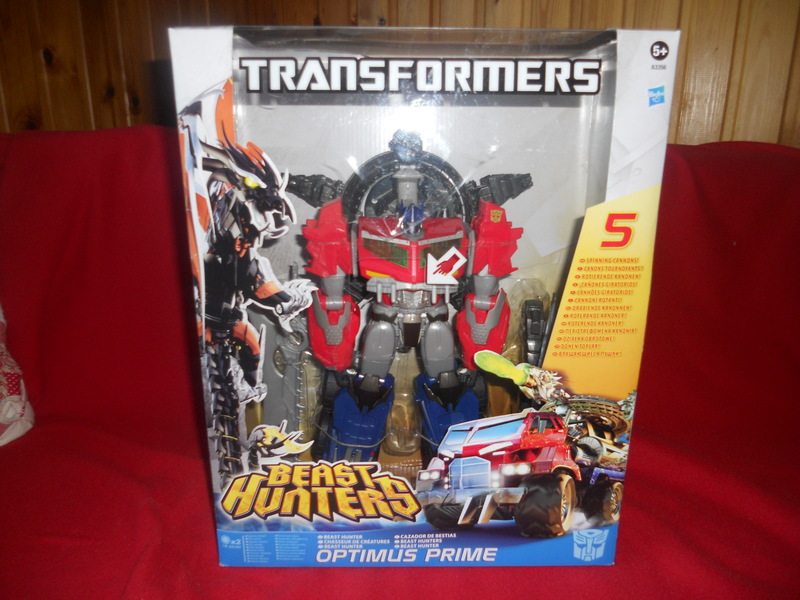 I knew exactly what would be on J and S’s Dream Toy List – Transformers Prime Beast Hunter Optimus Prime Figure. I am excited to see the full Dream Toys 2013 list which will be released by Argos in November. But for now, we are LOVING Optimus. He arrived in the post and when J and S saw the box they were VERY excited! I mean really, what little boy, wouldn’t be – he is very impressive with his dragon shield, power sword, green eyes that light up and dragon canons! They were lots of “wows”!!!! “”Just what I always wanted”, “Awesome!” phrases flying about the room. They were quick to get it opened up and get playing with this guy. I have to admit though, it can be quite frustrating for both a 3 and a half year old and a 2 year old when the toy has to be all untied from it’s packaging before you can play. While I do understand it keeps the toy safe, J and S’s patience doesn’t really allow for that! Once we got him out it was go, go, go!!! 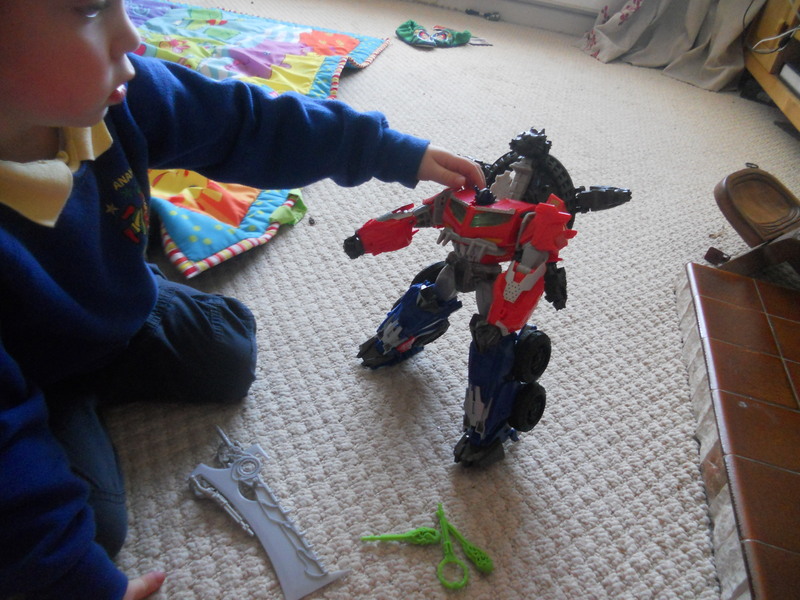 J quickly discovered Optimus’ moveable head, shoulders, elbows, hips and knees, and was quick to change him into all kinds of ‘battle’ poses. Almost immediately he wanted to ‘fire his weapons’. 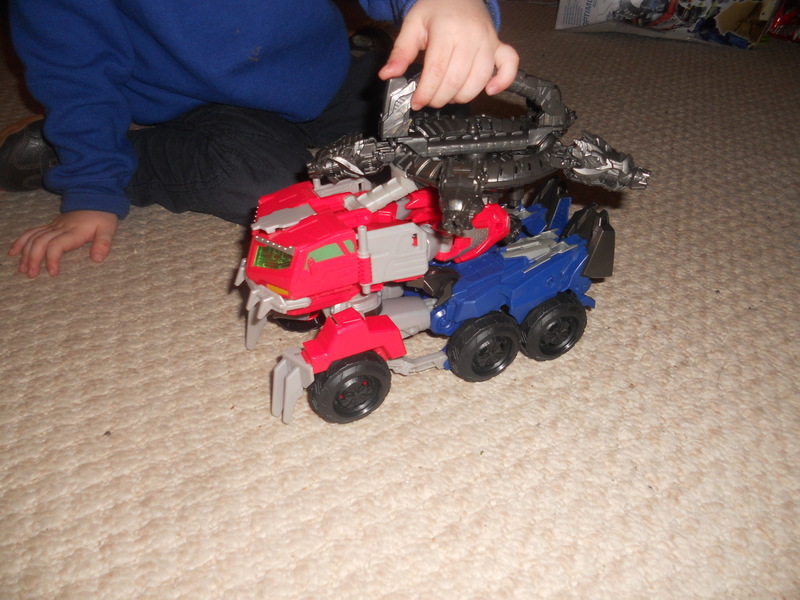 Optimus comes with 5 missiles to launch from his dragon – headed, revolving canon – much to the boys delight! After being shown by me how to load it up and fire them the boys could then do it independently, easily enough. I have noticed at different points throughout the week that they have had a little difficulty, but I am sure with continued play and practice it will get easier for them! Like any good Transformer Optimus converts into a vehicle, quite a robust looking, almost military type vehicle! 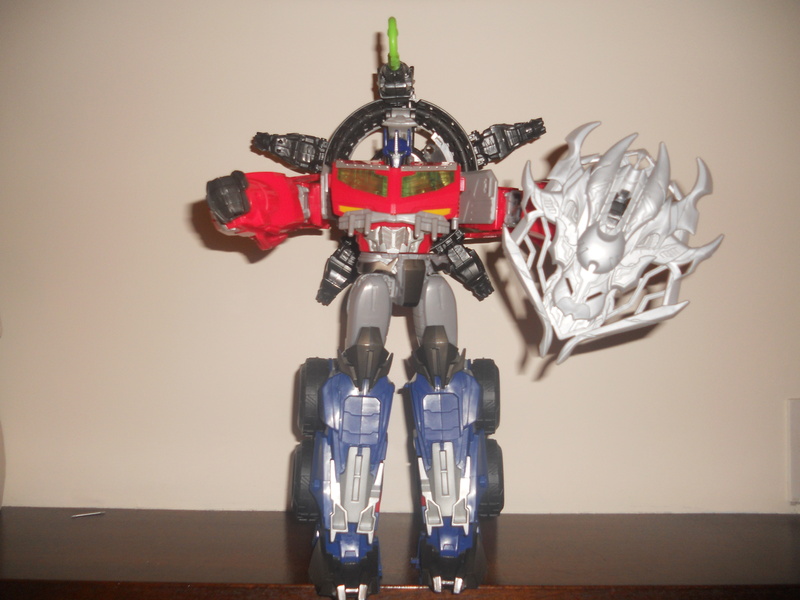 But I have to say I found it difficult to transform him. J and S definitely couldn’t do it and I struggled! 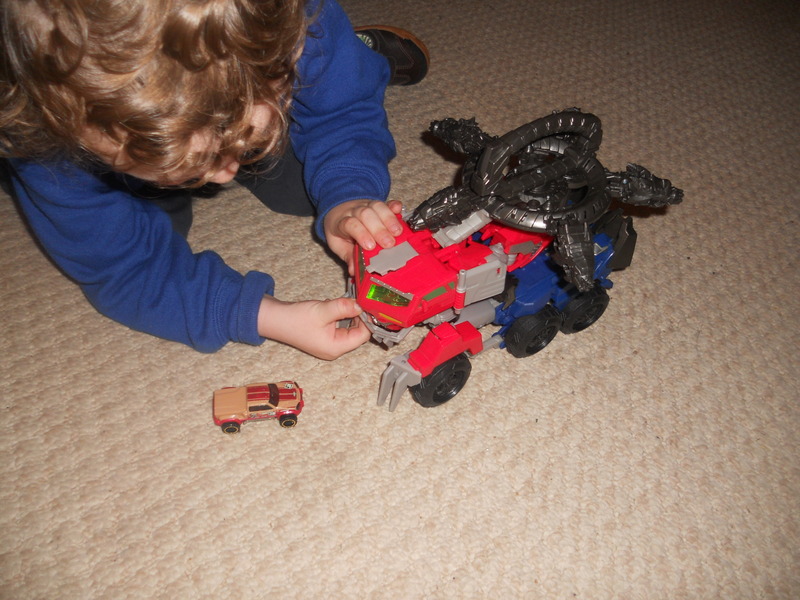 We had to just play with him in Robot Mode until Daddy came home before we could transform him. The instructions that come with this toy aren’t great. They are simple pictures, but I think some written instruction would help to clarify what you need to do. 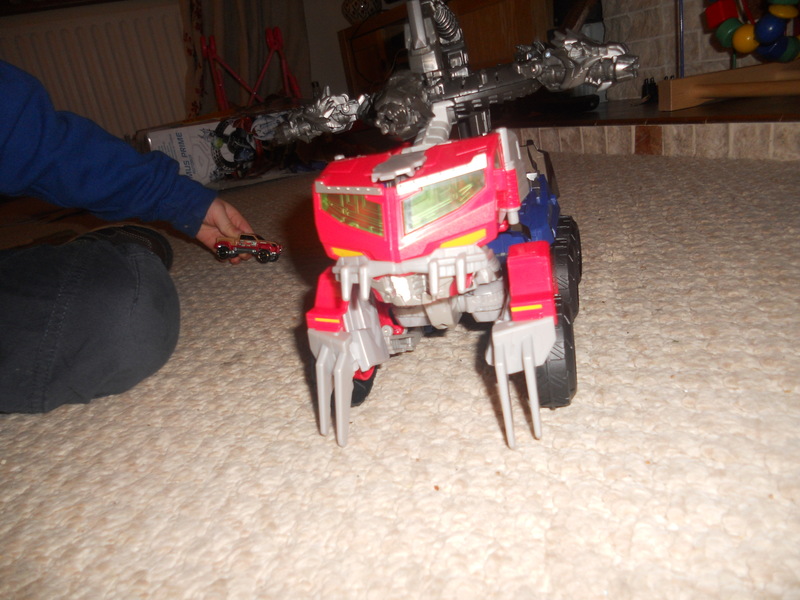 Once we got him transformed into vehicle mode, the boys were again delighted and have had hours of fun firing the missiles at various targets. There is a handle on the back which allows it to be carried around – little sister did like carrying it around as a new handbag. 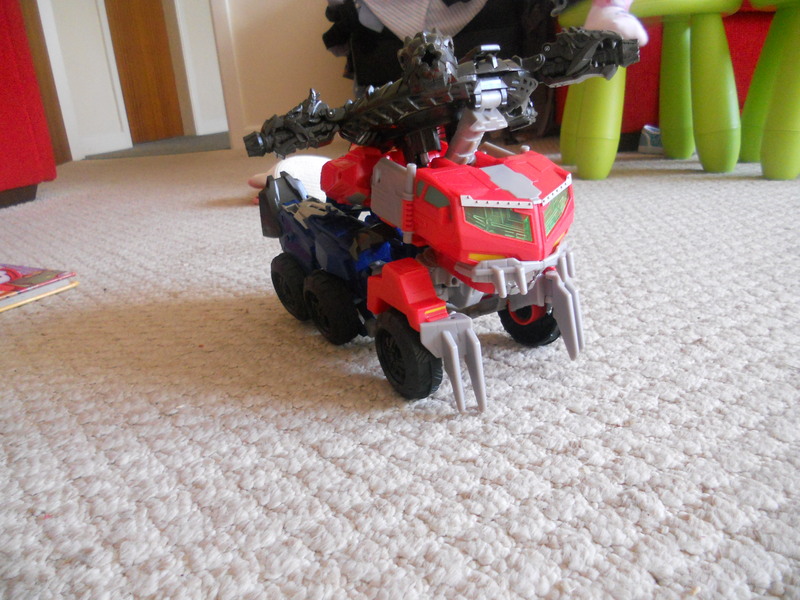 On that note, I was delighted to find that this toy is pretty robust. He has withstood some fairly rough battles with some of our other toys and indeed the somewhat reckless approach of a 2 year old and 1 year old! 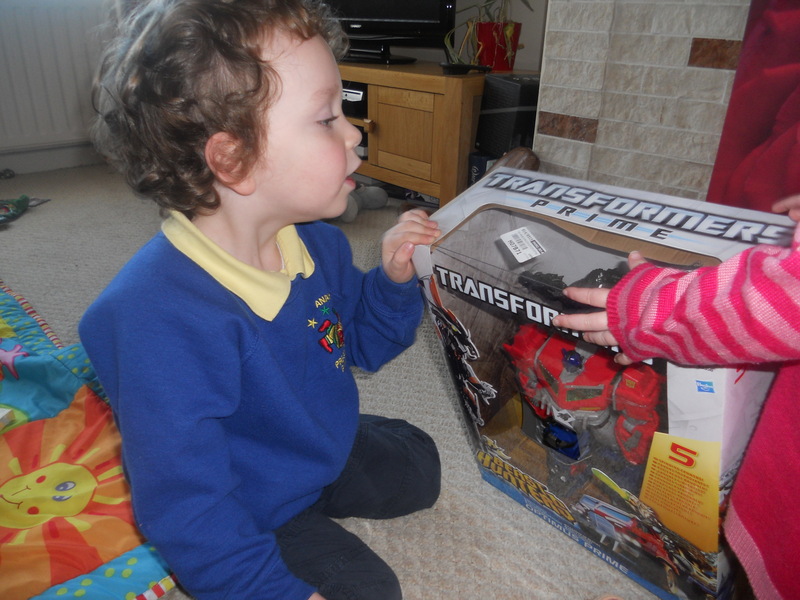 J and S have really enjoyed playing with Optimus Prime. I think it is a toy that while they can and very much do enjoy playing with now, they will get a lot more out of when they are older and can work it more easily. 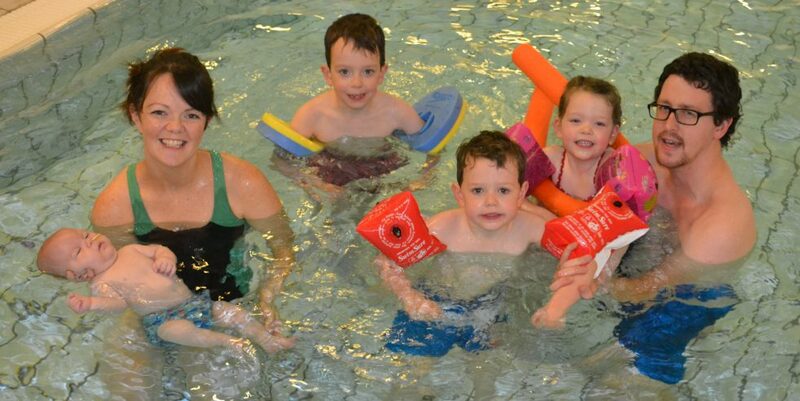 I find it quite expensive as it is quite limited in its uses and relies a lot on the child’s imagination. Don’t get me wrong, I love a toy that encourages imagination, but at the RRP of £49.99 I would like little more for my money. He has been played with daily since arriving at our house and I am sure he will be played with again and again! Previous Post He is My Light! Next Post Who thought it would be such a hit?! 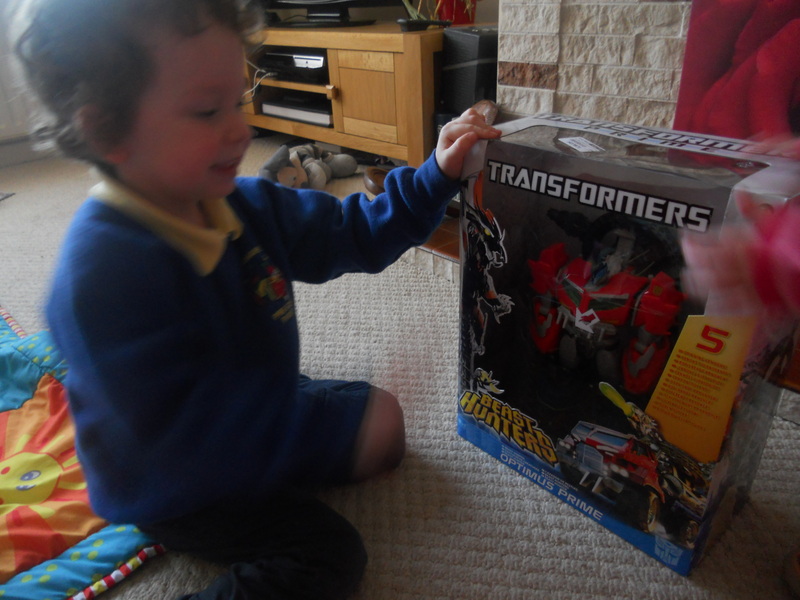 They are over the moon with Optimus! and so they should be, it’s a very expensive toy. I bet he’d secretly love it! Wow!! Will have to get Ian one for his stocking!! He would just LOVE it! !